The latest 13F reporting period has come and gone, and Insider Monkey is again at the forefront when it comes to making use of this gold mine of data. We have processed the filings of more than 700 world-class investment firms that we track and now have access to the collective wisdom contained in these filings, which are based on their September 30 holdings, data that is available nowhere else. In this article we’ll revise if you should consider Fluor Corporation (NYSE:FLR) for your portfolio? We’ll look to this invaluable collective wisdom for the answer. Fluor Corporation (NEW) (NYSE:FLR) was in 23 hedge funds’ portfolios at the end of the third quarter of 2018. FLR has experienced an increase in hedge fund sentiment of late. 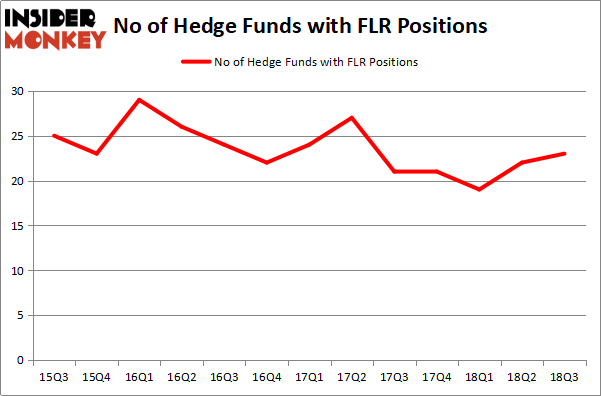 There were 22 hedge funds in our database with FLR holdings at the end of the previous quarter. Even though FLR is not one of the most popular stocks among hedge funds (check out the list of 30 most popular stocks among hedge funds in Q3 of 2018), it is still worthy of considering as the number of smart money investors bullish on it grew by 1 from the previous quarter and we read some positive reviews about the stock. 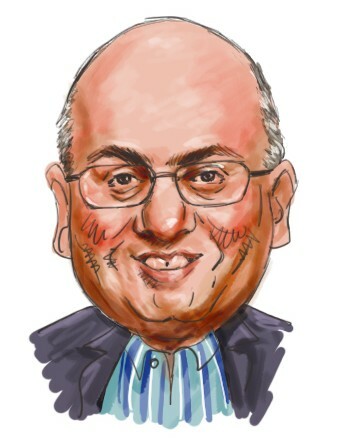 Before we analyze the key hedge fund action encompassing Fluor Corporation (NYSE:FLR), let’s take a look at what Goldam Sach’s analyst Jerry Revich said about this stock. “Goldman Sachs Machinery, Engineering & Construction analyst Jerry Revich expects the upcoming analyst day for Buy rated Fluor (FLR, on the CL) to be a positive catalyst for shares, and importantly messaging to lay the groundwork for positive street revisions. He expects management to lay out the margin and cost profile of its LNG line of business, ultimately providing a line of sight on a return to historical margin levels amid a cyclical recovery. Importantly, he expects management to discuss meaningful reductions (and potentially eliminations) in NuScale technology (modular nuclear) development costs in 2019. Combined, investor views of normalized earnings power could approach $4.50 vs 2019E consensus EPS of $3. How have hedgies been trading Fluor Corporation (NYSE:FLR)? At Q3’s end, a total of 23 of the hedge funds tracked by Insider Monkey were bullish on this stock, a change of 5% from the second quarter of 2018. On the other hand, there were a total of 21 hedge funds with a bullish position in FLR at the beginning of this year. With hedge funds’ positions undergoing their usual ebb and flow, there exists an “upper tier” of notable hedge fund managers who were increasing their holdings considerably (or already accumulated large positions). The largest stake in Fluor Corporation (NYSE:FLR) was held by Alyeska Investment Group, which reported holding $80.5 million worth of stock at the end of September. It was followed by Ariel Investments with a $62.9 million position. Other investors bullish on the company included Point72 Asset Management, Scopus Asset Management, and Element Capital Management. Consequently, some big names were breaking ground themselves. Point72 Asset Management, managed by Steve Cohen, assembled the biggest position in Fluor Corporation (NYSE:FLR). Point72 Asset Management had $47 million invested in the company at the end of the quarter. Alexander Mitchell’s Scopus Asset Management also initiated a $34.9 million position during the quarter. The following funds were also among the new FLR investors: Brian Gustavson and Andrew Haley’s 1060 Capital Management, Louis Bacon’s Moore Global Investments, and Gavin Saitowitz and Cisco J. del Valle’s Springbok Capital. Let’s go over hedge fund activity in other stocks – not necessarily in the same industry as Fluor Corporation (NYSE:FLR) but similarly valued. These stocks are Guidewire Software, Inc. (NYSE:GWRE), CDK Global, Inc. (NASDAQ:CDK), Aspen Technology, Inc. (NASDAQ:AZPN), and Nordson Corporation (NASDAQ:NDSN). This group of stocks’ market caps are closest to FLR’s market cap. As you can see these stocks had an average of 26 hedge funds with bullish positions and the average amount invested in these stocks was $669 million. That figure was $367 million in FLR’s case. Guidewire Software, Inc. (NYSE:GWRE) is the most popular stock in this table. On the other hand Nordson Corporation (NASDAQ:NDSN) is the least popular one with only 16 bullish hedge fund positions. Fluor Corporation (NYSE:FLR) is not the least popular stock in this group but hedge fund interest is still below average. This is a slightly negative signal and we’d rather spend our time researching stocks that hedge funds are piling on. In this regard GWRE might be a better candidate to consider a long position.